SUPER FALCON II today is the best dolly for professional film makers. Characterized by great stability, manoeuvrability, manageability and versatility, it requires the absolute minimum of maintenance. Engineered and designed with the latest technology in structural materials and surface finishes, tested thoroughly to ensure an accurate and reliable operation. The SUPER FALCON II dolly is very resistant so guarantees its performance under every environmental condition. 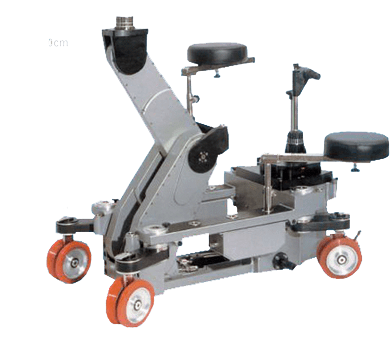 Dolly can be equipped with two different types of wheels; the standard wheel of selected hardness may be used directly on the studio floor, or on any standard track; and mixed wheel incorporating the standard wheel along with an inflated rubber wheel, excellent flexibility and performance when used on whatever surface even if it is not completely smooth. Steering mode can be quickly changed from four wheel “CRAB” operation, into “ROUND” four-wheel steering and two wheel “CONVENTIONAL” operation or vice versa by simply twisting the steering bar handle. A very high tech gears steering is located between the rear wheels to facilitate this operation in the “ROUND” mode, avoiding friction. The steering column can be removed by unscrewing the threaded base ring and the transmission shaft. A simple release device, at the base of the column, locks the steering facilitating realignment of the wheels when this is necessary. The steering box is a gear-base one, so there is no need for adjustment of the chains. The dolly’s vertical lift maintains precise camera alignment during the whole run of the arm. It is possible to mount the 90° Accessory plate on the mounting plate, so operator can work in the very low positions. Pressure accumulator may be recharged manually (by removing the control bar and inserting it in the manual pump and pumping), or electrically (the pump motor is connected to the main power by a supplied cable and activated by an ON/OFF switch). The motor automatically stops when it reaches the preselected pressure. Aspecial device, in both cases, prevents any damage by over pressurizing. Dolly is equipped with a new kind of piston that embodies an end run “dashpot”.